Time for some news, summer has been quite busy at Joe’s Garage and around. The one year squatted office building on the Arent Krijtsstraat 1 in Diemen is gone, back to the owner, with a fence around it but not much of a future. On June 30th, after seven years of emptiness, the Cruquiusweg 117 was squatted, making place for a new project, De Binderij, bringing some new life to this spooky Cruquiusgebied. Numerous anti-squatted buildings are rotting away in this desolate neighbourhood, symbolising more than ever the failure of local politicians in developing a neighbourhood or just keeping life going on. 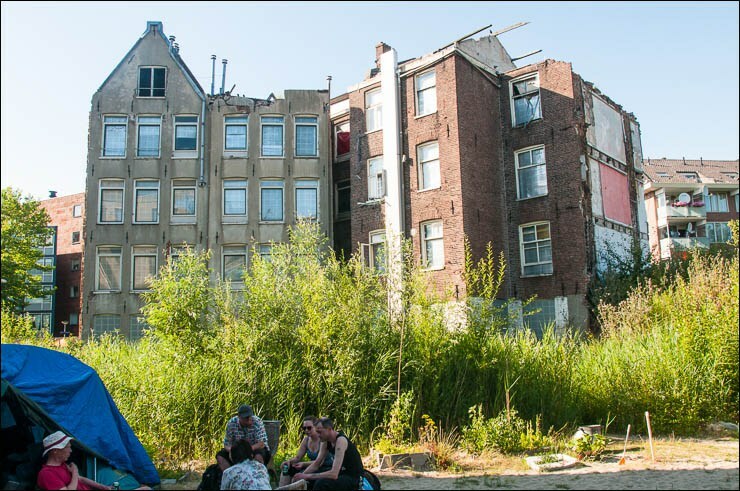 On July 2nd, the City of Amsterdam launched its second eviction wave of the year, unleashing its dogs to evict nine squats. 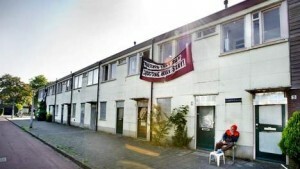 Swammerdamstraat 12 was evicted for the fourth time. 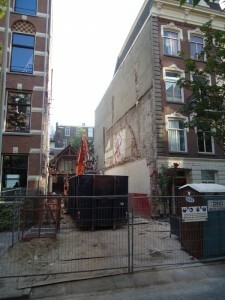 The greedy owner did not wait long to demolish it, infuriating still more neighbours. Thanks to the mayor, an extra sand yard has appeared! 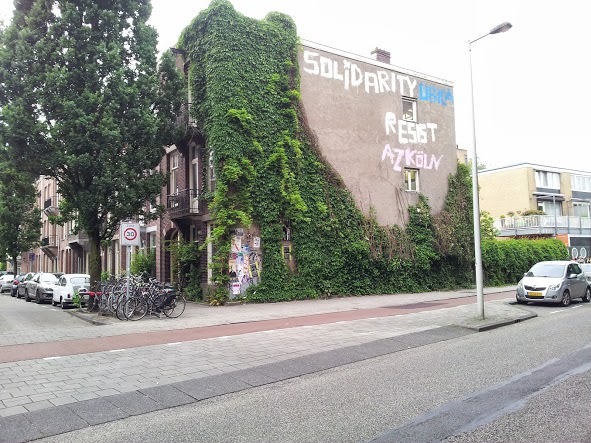 Squats on the Czaar Peterstraat, the Simon Stevinstraat 25 (Willem Beukels Alternatief), the Cornelis Drebbelstraat 35 (LaRage) and the Bessemerstraat 23 (El Taller social center) were also evicted. 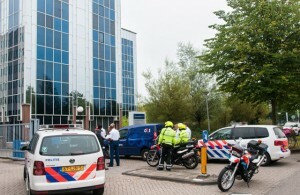 The local media, in need of sensation, again questioned if squatting was dead. An answer came a few days later, from the streets. During the week-end from July 7th, 26 houses were squatted on the Lorentzlaan and the Pasteurstraat in Watergraafsmeer. 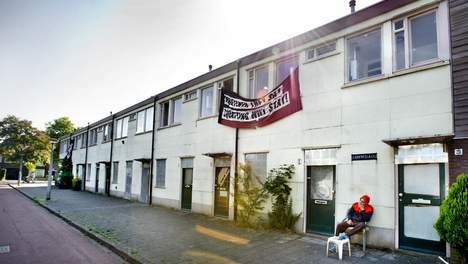 Owned by Rochdale, one of the most corrupt housing corporation in the Netherlands, these houses are promised to demolition. On July 20th, the Valreep squat was celebrating two years existence, with a massive Legalisation Manifestation, attracting more than a bunch of squatters but also a neighbourhood. A day later, Roomtuintje Oostbos and Pieter Vlamingstraat 98 were also celebrating their first anniversary. 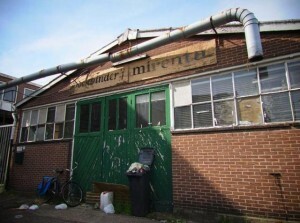 The empty office building on Karspeldreef 2 in the Bijlmer, Amsterdam South-East was squatted on August 24th. All the upper floors are empty, there’s not a few paper boxes on the ground floor that will save Rochdale from the squatters. Here again, a neighbourhood full of empty office buildings. 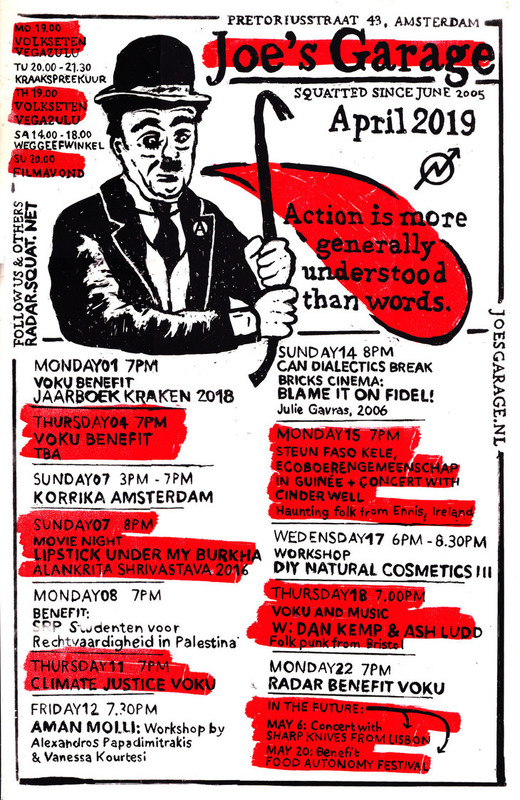 presenting their squatted social center, the Transfo and talking about squatting in France, the “Genova 2001 is not over” benefit for the activists convicted after the G8 protests, two info nights and benefits for our comrades fighting against the State in Turkey and Brazil. 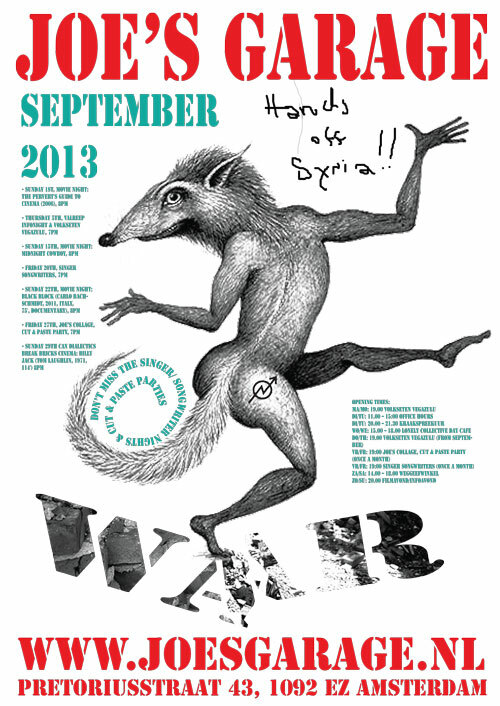 The coming weeks at Joe’s Garage, you’ll get the Valreep organising an info night, ‘Get legalised or get evicted‘. On the film program, we’ll get to see The Pervert’s Guide to Cinema, Midnight Cowboy, Black Block and Billy Jack. The Thursday Vegazulu voku is back after a summer break. 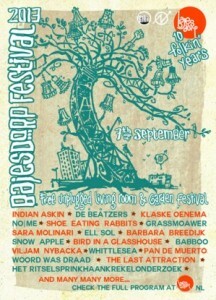 Two events are now taking place once a month on fridays, the Cut & Paste Party and the Singer Songwriters. And not to forget, Saturday September 7th, next to the main jail, Bajesdorp will celebrate ten years of rebellion with their music and theatre festival. You are discovering Joe’s Garage for the first time? Welcome to an autonomous squatted political social center, a meeting place in the Transvaal neighbourhood for squatters and non squatters, subsidy free, entirely run by volunteers. This is what we have been doing these last years. 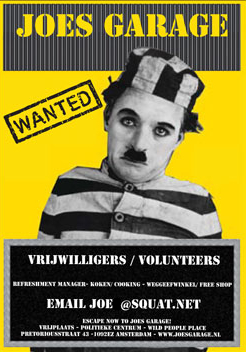 New faces, new projects are very welcome, bring your ideas, get involved. Thanks a lot to all our volunteers! If you want to be aware of any event happening at Joe’s Garage, your may import Joe’s iCalendar feed in your own calendar.